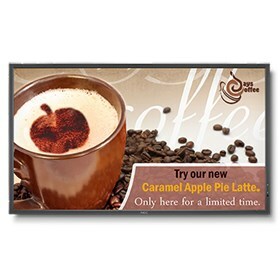 The NEC X474HB is a 47" Full HD commercial LED monitor used to display commercial content. This business-ready monitor features a 1920 x 1080 native resolution for viewing detailed full HD images without pixel loss. This monitor's notable 1600 cd/m² brightness rating and 1300:1 contrast ratio showcases its ability to handle light and dark on-screen images. The LED backlighting allows for reduced power consumption while the carbon footprint meter enables responsible use of the display conserving green gas emissions in real time. The X474HB is equipped with VGA, DVI, displayport, and HDMI ports for connecting a variety of video sources. It features Smart sensing technology that automatically detects your work conditions to determine proper display brightness with ambient light sensor. The NEC X474HB has many exciting features for users of all types. See the NEC X474HB gallery images above for more product views. The NEC X474HB is sold as a Brand New Unopened Item.